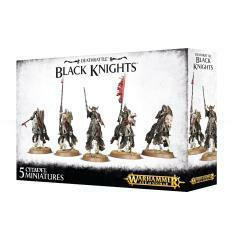 This multi-part plastic boxed set contains 91 components with which to make 5 Black Knights, carrying crypt shields and wielding barrow lances. One model can be assembled as a Hell Knight, leader of the unit, and two can be assembled as a standard bearer and hornblower respectively. This kit can optionally be used to assemble 5 Hexwraiths. Supplied with 5 Citadel 60x35mm Oval bases.